THE Beyond programme is gearing up for a series of workshops and ‘ask the expert’ appointments to mark Global Entrepreneurship Week which takes place in November. 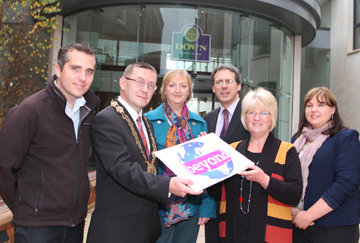 At the launch of the Global Entrepreneurship Week in November are Beyond staff Michael Foster, and Rhonda McDowell, right, with Down District Council Chairman Counillor Mickey Coogan, Janice Symington, Down Business Centre manager, Paul Welsh, SERC business head, and Councillor Anne McAleenan, Chairperson of the Council Economic and Cultural Development Committee. Speaking at the launch, Down District Council Chairperson Councillor Mickey Coogan said: “The Down District Council’s Beyond team is calling on all business owner/managers across the district to get involved, ‘breakout and breakthrough’ and get their business in shape for 2013. “The Beyond programme is about offering practical business support and solutions. The programme is delivered locally and is targetted specifically at businesses based in Down District. The ethos of the Beyond Programme is to encourage business owners to work together to create business opportunities, develop business knowledge and make business connections. Elaborating on Councillor Coogan’s comment, Councillor Anne McAleenan, Cultural and Economic Development Commitee Chairperson said: “Members of the local business community who want to explore planning and funding for business success can attend a workshop on Thursday 8 November or for those who wish to get ‘beyond the limitations of their business’ are invited to a free lunchtime seminar on Monday 12 November. For more information, to register for an event or to book an appointment please visit www.beyondni.co.uk or telephone 028 4461 0856 / 078 1753 1389.